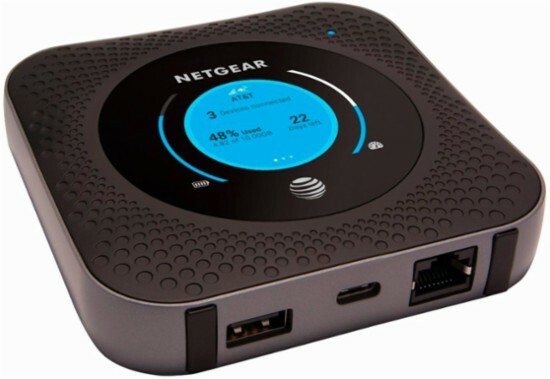 AT&T Nighthawk Hotspot (Netgear ATLAS M1) includes 2 antenna ports to attach external cellular antennas. See below for different options for high gain and high performance indoor and outdoor antennas to improve the signal strength and indoor coverage. Additionally, see below for RF bidirectional amplifiers/ distributed antenna systems/ repeaters/ small cells to further improve indoor coverage without directly attaching pigtail/ cable the device. See below for the most popular LTE antenna kits to boost the signal of your AT&T Nighthawk Hotspot (Netgear ATLAS M1). These kits include cables, lightning protection, and all required pigtails/ adapters. If none of these pre-configured kits works for you, see below for customized solutions. Also available with 100 ft cable RFWY12-MR1100-100 or see below for custom configuration. Also available with 100 ft cable RFWP10-MR1100-100 or see below for custom configuration. Also available with 100 ft cable RFW0M9-MR1100-100 or see below for custom configuration. Find other signal booster kits for ATT devices. Find other signal booster kits for Telstra devices. STEP 1: Your AT&T Nighthawk Hotspot (Netgear ATLAS M1) operates on these frequency bands: LTE Band 1, LTE Band 2, LTE Band 3, LTE Band 4, LTE Band 5, LTE Band 7, LTE Band 12, LTE Band 29, LTE Band 30, LTE Band 66. Determine what frequency bands your operator uses here, then click on the frequency band link to view the best rated 4G LTE antennas compatible with the frequency band that both your device and your cellular operator supports. To use your AT&T Nighthawk Hotspot (Netgear ATLAS M1) in a vehicle, consider the LTE antennas below. AT&T Nighthawk Hotspot (Netgear ATLAS M1) is not listed as having an external WLAN antenna port in the RFWEL Wireless Device Information Database. This may be either because the device really does not have an external antenna port or RFWEL Wireless Device Specialists have not confirmed the existence and utility of such ports. Please contact us for the latest updates or if you believe this device contains external antenna ports and you would like to learn more about compatible signal improvement solutions. It is very difficult to accurately predict the WiFi range because it is highly dependent on the environment where the device is used (e.g., number of obstructions, number of interferers such as other devices using the unlicensed Wifi bands, etc). That said, a useful indoor range of around 10-15 meters (~33ft to 50ft) is reasonable, more if you have a direct line of sight to the MiFi. You can still connect further away but your speed drops. Theoretical range for 802.11b/g is around 100m (330ft) outdoors and half that indoors; 802.11n roughly doubles this range.